If you lock the door with a key, all vehicle doors will lock automatically. From the driver’s door, turn the key to the right once to unlock the driver’s door and once more within 4 seconds to unlock all doors. When closing the door, push the door by hand. Make sure that doors are closed securely. The unlock mode changes alternately by pressing the lock button and unlock button on the remote key (or smart key) at the same time for 4 seconds or more. The hazard warning lights will blink four times to indicate that the mode conversion is completed. To lock the doors, press the Door Lock button (1) on the remote key. 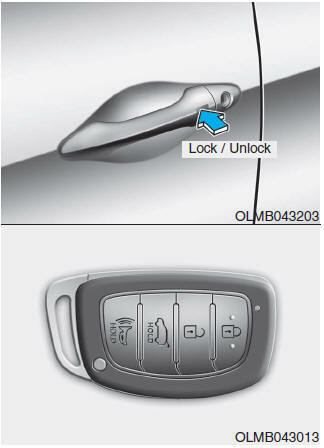 Press the Door Unlock button (2) on the remote key, the driver’s door will unlock. If you press the Door Unlock button on the remote key again within four seconds, then all the doors will unlock. To lock the doors, press the button on the outside door handle while carrying the smart key with you or press the door lock button on the smart key. Press the button on the outside door handle while carrying the smart key with you or press the door unlock button on the smart key, the driver’s door will unlock. If you press the Door Unlock button on the smart key again within four seconds, then all the doors will unlock. The unlock mode changes alternately by pressing the lock button and unlock button on the smart key at the same time for 4 seconds or more. The hazard warning lights will blink four times to indicate that the mode conversion is completed. To unlock a door, push the door lock button (1) to the “Unlock” position. The red mark (2) on the door lock button will be visible. To lock a door, push the door lock button (1) to the “Lock” position. If the door is locked properly, the red mark (2) on the door lock button will not be visible. To open a door, pull the door handle (3) outward. If the inner door handle of the driver’s (or front passenger’s) door is pulled when the door lock button is in the lock position, the button is unlocked and door opens. Front doors cannot be locked if the key is in the ignition switch and any front door is open. Doors cannot be locked if the smart key is in the vehicle and any door is open. If a power door lock ever fails to function while you are in the vehicle try one or more of the following techniques to exit: Operate the door unlock feature repeatedly (both electronic and manual) while simultaneously pulling on the door handle. 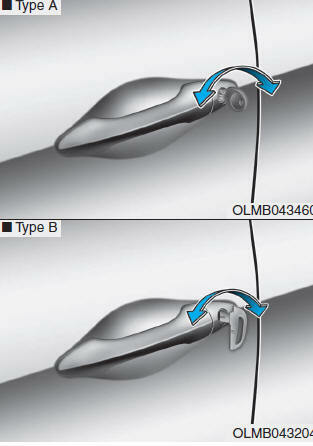 Operate the other door locks and handles, front and rear. Lower a front window and use the mechanical key to unlock the door from outside. 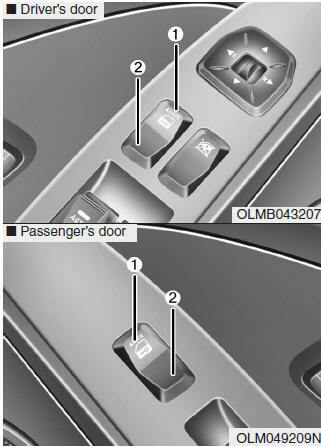 When pressing the front portion (1) of the switch, all vehicle doors will lock. 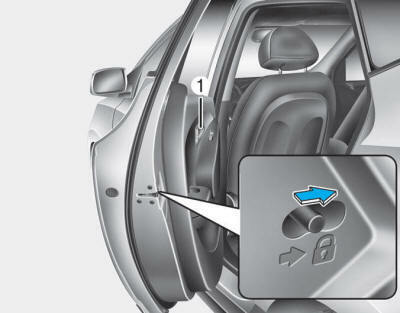 When pressing the rear portion (2) of the switch, all vehicle doors will unlock. If the key is in the ignition switch and any door is opened, the doors will not lock even though the lock button (1) of the central door lock switch is pressed. If the smart key is in the vehicle and any door is opened, the doors will not lock even though the lock button (1) of the central door lock switch is pressed. The doors should always be fully closed and locked while the vehicle is in motion. If the doors are unlocked, the risk of being thrown from the vehicle in a crash is increased. Do not leave children or animals unattended in your vehicle. An enclosed vehicle can become extremely hot, causing death or serious injury to unattended children or animals who cannot escape the vehicle. Children might operate features of the vehicle that could injure them, or they could encounter other harm, possibly from someone gaining entry to the vehicle. Leaving your vehicle unlocked increases the potential risk to you or others from someone hiding in your vehicle. To secure your vehicle, while depressing the brake, move the shift lever to the P (Park) position, engage the parking brake, and place the ignition switch in the LOCK/OFF position, close all windows, lock all doors, and always take the key with you. Opening a door when something is approaching may cause damage or injury. Be careful when opening doors and watch for vehicles, motorcycles, bicycles or pedestrians approaching the vehicle in the path of the door. All doors will be automatically locked when shifting the transaxle shift lever out of P (Park) with the engine is running. All doors will be automatically unlocked when shifting the transaxle shift lever into P (Park) with the engine is running. Auto door lock/unlock by shifting the shift lever out of P (Park) or into P (Park) If you want to activate or deactivate some door lock/unlock feature, consult an authorized HYUNDAI dealer. The child safety lock is provided to help prevent children seated in the rear from accidentally opening the rear doors. The rear door safety locks should be used whenever children are in the vehicle. The child safety lock is located on the edge of each rear door. When the child safety lock is in the lock position ( ), the rear door will not open if the inner door handle (1) is pulled. 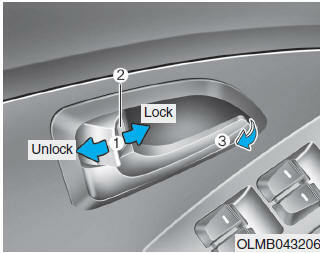 To allow a rear door to be opened from inside the vehicle, unlock the child safety lock. If children accidently open the rear doors while the vehicle is in motion, they could fall out of the vehicle. The rear door safety locks should always be used whenever children are in the vehicle.